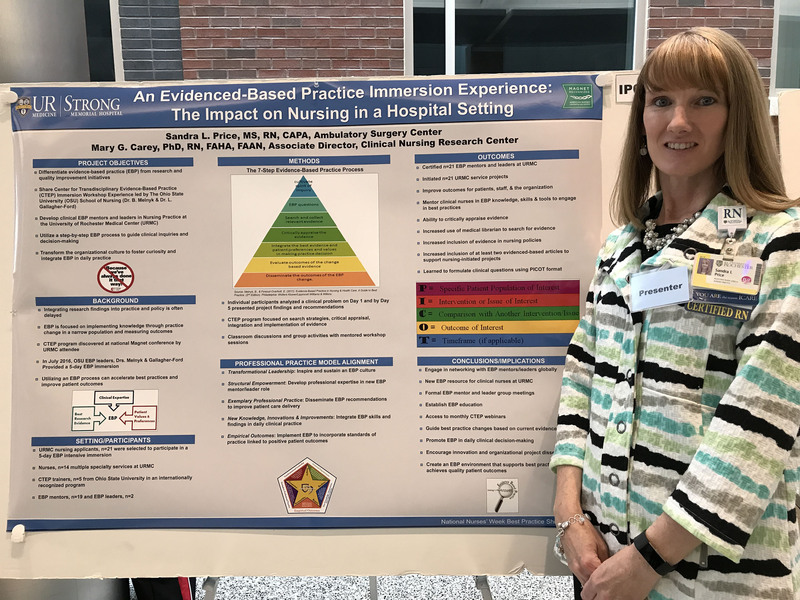 NYSPANA | "An Evidenced-Based Practice Immersion Experience and its Impact on Nursing in a Hospital Setting"
Background: The goal of Evidence-Based Practice (EBP) is the integration of clinical expertise, scientific evidence, and patient preference. Purpose: The purpose of the Center for Transdisciplinary Evidence-Based Practice (CTEP) immersion program is to elevate an EBP culture that integrates all components of the professional practice model using a systematic approach to explore health care problems and their solutions. Methods: The CTEP 5-day immersion program focused on search strategies, critical appraisal, integration and implementation of evidence. A seven-step EBP process includes: (0) create a spirit of inquiry, (1) ask clinical question in PICOT format, (2) search for the evidence, (3) critically appraise the evidence, (4) interpret the evidence, (5) evaluate the outcomes and (6) disseminate the EBP results. Results/Outcomes: Participating in CTEP provided knowledge, skills, and tools for clinical nurses to engage in best practices across our organization. As a result, the alumni of the immersion program became certified EBP Mentors and Leaders to help disseminate and role model active EBP in clinical practice. Conclusions/Implications for Practice: Engaging nurses to utilize the EBP seven-step process will promote inquiry and guide clinical decision making to improve outcomes for patients, families, staff and the organization.